NEW YORK (NYTIMES) - You are in a diner from yesteryear, sliding onto a stool at a long Formica counter. On the back bar are glass pots of brewed coffee perched on hot plates and a bank of heavy-duty waffle irons, ready and waiting. You have come expressly for a breakfast waffle, but not just for the waffle. It is the whole experience - the coffee, the glass of ice water, the whipped butter, the warm syrup. You watch and wait as the batter puffs up under the clamped-down lid. In five minutes, a fragrant, golden round waffle appears. Whether fantasy or reality, it is a lovely image. But all waffles are not breakfast waffles, and not all are sweet. Some can be savoury, and even dressed up for a party. Embellished with smoked salmon and caviar, in fact, they are ideal for a celebratory soiree or midnight supper. A touch of fine cornmeal in the batter gives these waffles a delicious crispness and a faint perfume. The usual suspects - flour, eggs, buttermilk and melted butter - are present, but the effect is lighter than air. To make hors d'oeuvres for a party, cut warm waffles into quarters or wedges and top each with a bit of smoked fish, a dab of lemony crème fraîche and a little caviar. Finish with a sprinkling of chives, dill and black pepper. The result is like blini, but with crunch. As for "caviar", choose what your budget allows. The term is used loosely to include all types of salted fish eggs. Salmon caviar provides a salty burst of flavour; trout roe is a bit more delicate. Whitefish roe, lumpfish roe and flying fish roe are other affordable options. If you have money to burn, opt for real sturgeon caviar, but you can also go without caviar altogether. For a midnight supper (or other meal), serve a whole waffle per person, going heavy on the garnishes. To make this rich dish even richer, drizzle it with warm melted butter, or top the waffles with poached eggs for a more substantial dish. 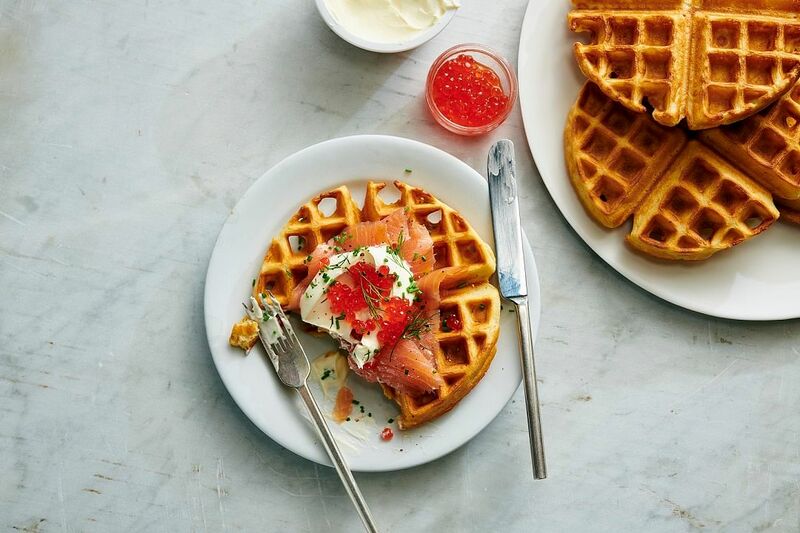 If you are thinking smoked salmon waffles would be just the thing for brunch, you are absolutely right. If you do not have a waffle iron, the batter can also be used to make savoury pancakes. Of course, if you prefer, serve these cornmeal waffles with elegant sweet toppings instead. 1. Make the batter: In a mixing bowl, stir together flour, cornmeal, salt, baking powder and baking soda. Whisk in buttermilk, eggs and butter. Beat briefly to produce a thick batter. Set aside at room temperature. 2. Prepare the condiments: Stir together crème fraîche and lemon zest, and transfer to a serving dish. On a platter, arrange the smoked salmon, caviar, chives and dill. 3. Heat the waffle iron according to manufacturer's instructions. When hot, ladle in a scant cup of batter. (This amount is for a round waffle with an 18-cm (7-inch) diameter. Adjust quantities for irons of other sizes.) Close the iron, and bake each waffle for 4 to 5 minutes, until well browned and quite crisp. You may hold waffles uncovered on a baking sheet in a 120 deg C oven, for up to 20 minutes.